Dr. King earned his medical degree from The University of Cincinnati College of Medicine and completed his residency training at The University of Alabama at Birmingham (UAB). He also performed fellowship training at UAB to gain expertise in the diagnosis and treatment of muscle and nerve disorders. 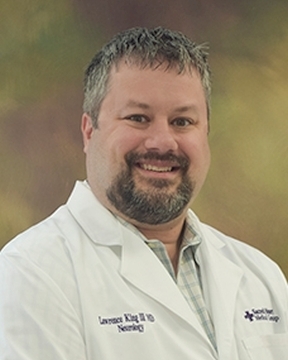 ... Read More Dr. King has special interest in general neurology, muscle and nerve disorders,and the treatment of migraines,especially using Botox therapy. In his free time,Dr. King enjoys traveling,meteorology and spending time with family. He lives in Pensacola with his wife Laura,two sons and dog.